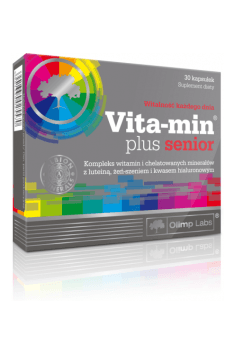 OLIMP Vita-Min® Plus Senior is an advanced supplement designed for older people. It contains a set of the most important vitamins and minerals, valuable nutrients and the ginseng extract. The supplement supports the overall health of the body and improves its functioning on many levels. It effectively balances the deficit of vitamins and minerals, provides substances important for the joint health and a proper vision. It can also increase the energy and vitality. It works great in the prevention of diseases typical for the elderly. Vitamins are the key compounds for keeping the body in a good shape. The human body is not able to produce them, but a varied and well-planned diet should cover the needs of the body system. In the case of seniors, it is difficult as they usually have less appetite, they stick to the certain schemes, and their menu is quite monotonous. Older people spend less time in the sun, which is why they should be especially careful about the proper supply of vitamin D.
The presented supplement provides all key vitamins. Among them is: vitamin A (supports proper vision, stimulates skin regeneration); vitamin C (strengthens immunity, fights free radicals, stimulates collagen production); high dose of vitamin D (strengthens bones and teeth, protects against osteoporosis); vitamin E (called ‘vitamin of youth’ - a strong antioxidant, slows down aging); a complex of B vitamins (they support metabolism, positively affect the memory and cognitive functions, some of them are involved in the homocysteine utilization, and thus reduce the risk of cardiovascular disease). Minerals, like vitamins, are not synthesized in the body and should be supplied with food. As in the case of the vitamins discussed above, this can be problematic for the elderly. A good alternative is to complement the shortages with supplements. However, one should make sure that minerals contained in the supplements are available in an easily absorbable form. The producer of the presented product opts for the highly bioavailable Albion® amino acid chelates. In the supplement we find magnesium (supports the nervous system and has positively affects the sleep quality); calcium (important for strong bones and teeth), potassium (regulates the water and electrolyte management); iron (prevents anemia from becoming common among the seniors); iodine (supports thyroid function); copper (participates in the production of collagen); zinc (strengthens immunity); manganese (supports insulin management, strengthens the motor apparatus); selenium (a natural antioxidant, slows aging). Korean ginseng (Panax ginseng) is a plant that has been traditionally used by traditional Chinese medicine specialists for centuries. The bioactive substances present in its root favourably affect the well-being, reduce fatigue, add energy and vital forces. In addition, they improve the lipid profile, strengthen the heart and circulatory system, stimulate the sexual desire. Ideally suited to seniors - they support those areas of the body, which are usually the first to be weakened with aging. Lutein is a key element in the prevention of macular degeneration (AMD) and cataracts - two eye diseases that are age-related. It is a yellow pigment that gives a characteristic colour to many plants. It belongs to the group of carotenoids and, like all other compounds in this group, is characterized by an extremely strong antioxidant effect. It efficiently neutralizes free radicals, which are mass-produced under the influence of UV rays and damage sensitive photoreceptor cells, located in the retina of the eye. Hyaluronic acid is a compound that strengthens the connective tissue structure and promotes the regeneration of joint cartilage. It is naturally present in the human body, but with age, its quantity is systematically decreasing. Used in the form of supplements is a key element of therapy and prevention of diseases within the movement apparatus. Reduces pain, increases mobility of joints. It can also reduce the appearance of wrinkles and boost skin firmness. In summary, OLIMP Vita-Min® Plus Senior is an ideal supplement for the elderly. Its composition is well-thought-out and very carefully composed. The preparation contains vitamins and minerals, which are crucial in the seniors' diets and an energy-adding ginseng extract. For even better action, the supplement is enriched with compounds supporting the vision and the condition of the motor system. This is one of the few preparations available on the market that allows to comprehensively care for the health of older people. Vita-Min Plus Senior 30 caps. 1 capsule once a day after the main meal, washed down with a lot of water. The supplement contains an optimal dose of vitamins, minerals and nutrients, therefore prophylactically taking 1 capsule a day is enough. It is worth to take it after the breakfast or dinner. Due to the ginseng present in the composition, which raises the energy level, the supplement should not be used in the evening. The supplementation is the most effective if continued for about three months, after which you can take a few months break. It is worth to reach for the preparation especially in autumn and winter, when an access to fresh fruit and vegetables is limited and there is little time that we spend in the sun. Microcrystalline cellulose - bulking agent, magnesium stearate - anti-caking agent, capsule (gelatin - capsule component, color: E171). A dietary supplement containing 5-hydroxytryptophan. Improves mood, facilitates sleep and concentration. Ginsenosides (triterpene saponins) are biologically active ingredient in ginseng root, its leaves and generative organs. Improve the oxygenation of the tissues of the body, affecting the increase in exercise capacity during the psychophysical effort. An antibacterial and antiviral strengthening immunity. By antioxidant action, limit the development of free radicals and membrane protein brain. Improve sexual ability. Used in sports supplementation at different levels of training. Improve concentration and ability to memorize. Available in mono-preparation supplement and herbal blends, herbal-mineralizing and herbal vitaminizing blends. Dosage: 10-50 mg per day.